It's been another busy week in the sewing room. 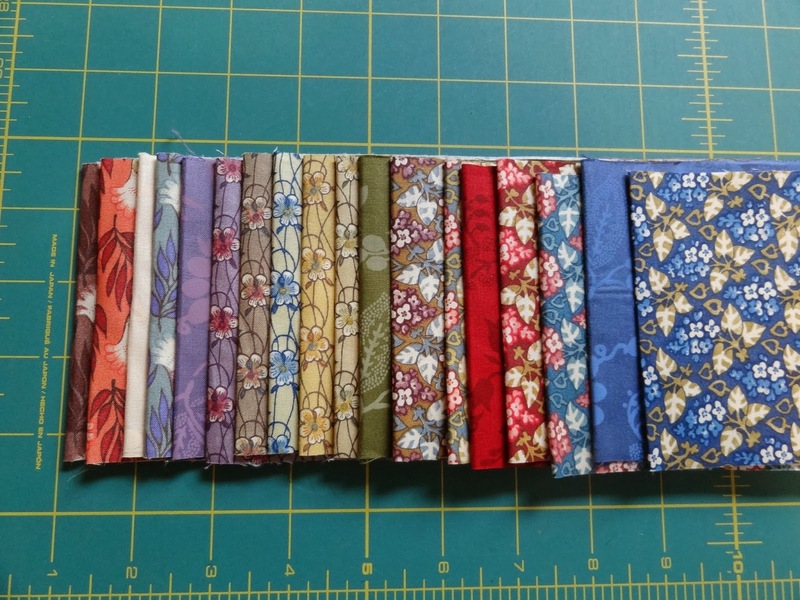 I now have another finish waiting to be quilted - or shall I saw waiting for Gracie May to mature enough that she won't jump all over the quilt while it's on the longarm! This is a quilt by Jaybird called Fast Forward. The brightly colored strips are actually a glazed chintz from the Netherlands! I've had them for quite some time just waiting for the right quilt to show them off! I was a bit scared of using such a deep purple to show them off, but I think it worked really well! The chintz came in a jelly roll of sorts. When I first opened the roll I was surprised to see they were 60 inches long! I was even more surprised to find three different prints on each strip - bonus! They were separated by a small, neutral stripe. I've never seen anything like it! I must say I really enjoyed working with this fabric! It holds it's shape and cuts so beautifully. No fraying, either. I also finished my October BOM from Kathy Schmitz. Isn't it adorable? The "Boo" flag is an iron-on applique. Check out this gorgeous butterfly. Can you guess what it is? It's the new doorknocker on the Squash House! Not only did we not have a doorbell, we didn't have a door knocker! It was hard to hear if anyone was at the door if you were downstairs. I saw this and crossed my fingers it would work - and it does! We're doing some minor updates here and there around the Squash House - just in time to celebrate Autumn's arrival - my favorite time of the year. As I finish them, I'll give you a peek. The biggest update will be new living room furniture that will arrive sometime around Christmas. It's always nice to add a new touch here and there, isn't it! That purple is a wonderful choice to highlight the chintz. A very beautiful butterfly. I can't wait to knock on your door, one day! love this quilt! is it available as a pattern yet? and your butterfly door knocker is perfect! Pretty colors. When we purchased our current home we didn't realize we didn't have a doorbell either. Our dog was always on hand to announce visitors. The mailman would honk to announce he was here with a pkg. my husband installed a doorbell a couple of years ago since Liddie is no longer with us.. The quilt finish is spectacular! I am so behind on my KS BOM :(. Love the new door knocker! Oh, I love that quilt! I'm not normally a fan of modern looking quilts, but I do love this one. So much that I might even tackle one myself! And the door knocker is beautiful! What a pretty thing to greet your visitors. Beautiful quilt , just love the purple background PERFECT! Wow, you've been busy. Love the quilt, so gorgeous and the purple really sets off the fabric ribbons. Love the new door knocker too. And your BOM is so cute. Can't wait for Gracie May to behave so you can quilt that gorgeous top. Hugs!! Love that purple background! It makes the design very striking! What a cute Pumpkin! Love the border! Your new door knocker is very pretty, Candace! What a fun quilt and such beautiful fabrics. 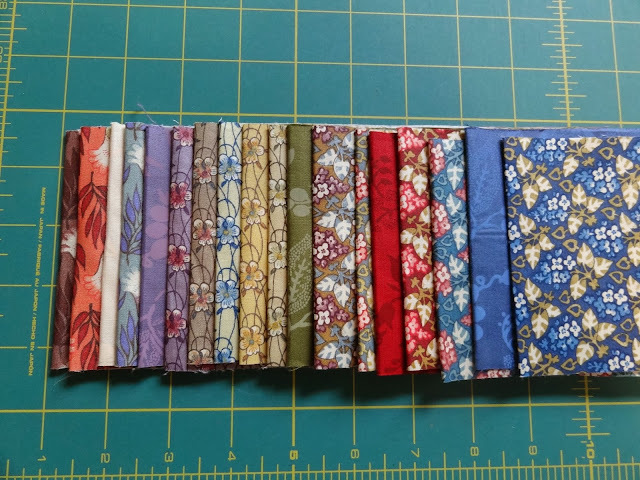 You're going to forget how to quilt by the time Gracie May grows up! The new quilt looks great! 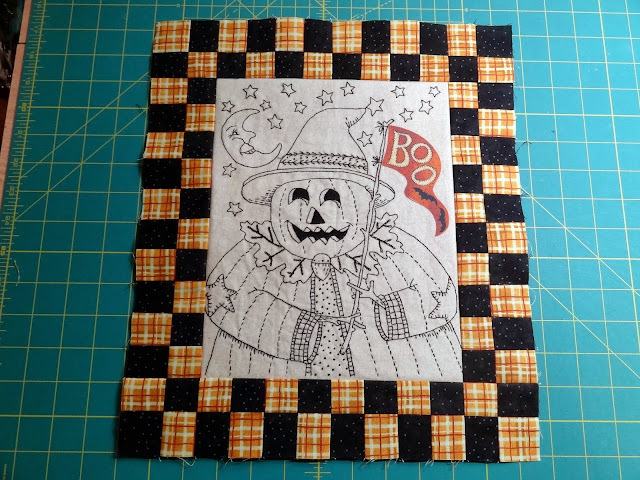 Your stitched quilt will be wonderful once the blocks are all together. 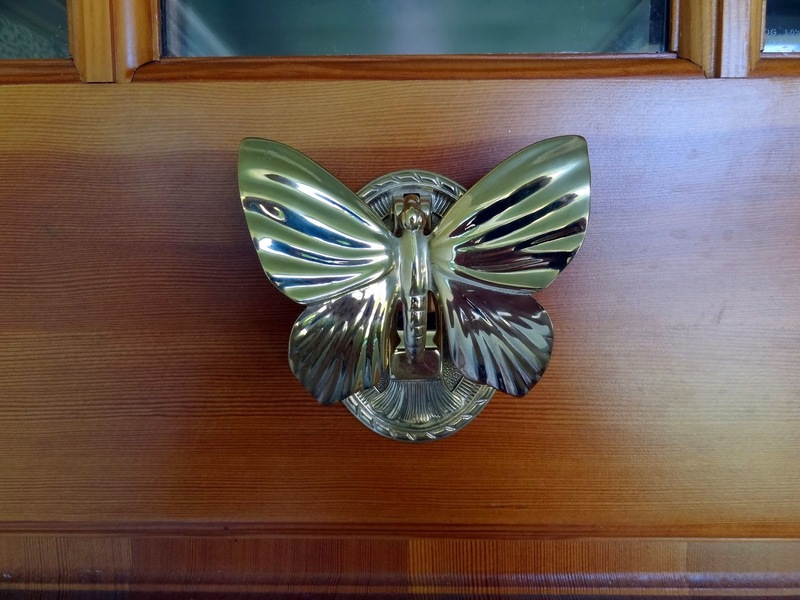 A butterfly door knocker - I think you have to listen very carefully to hear it! Love that purple! It looks like a perfect setting for the colorful chintz fabrics. Your butterfly doorknocker is definitely an invitation for all the real butterflies in the neighborhood to come and visit the beauty in your backyard. New living room furniture? How exciting! I can wait for the reveal! You've been busy in the sewing room! The purple was a great choice! 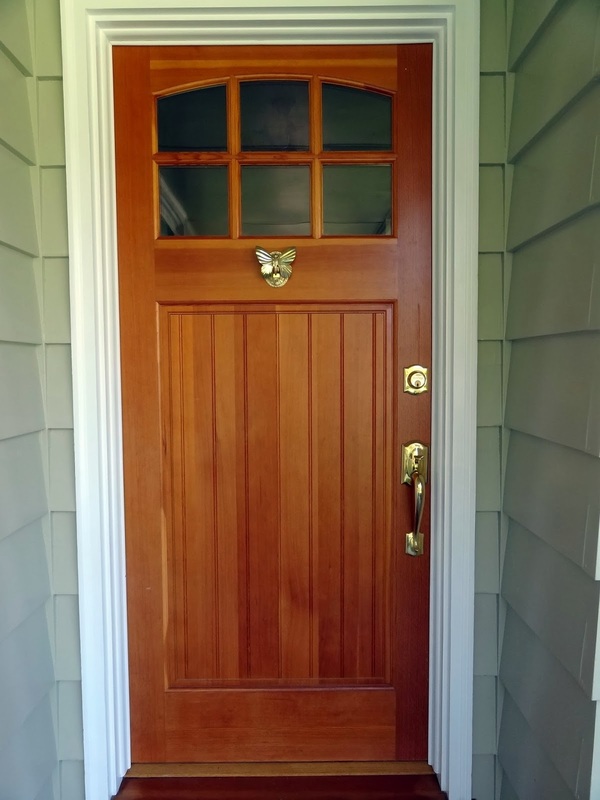 Love your front door! Can't wait to see what you picked for the living room. I love the purple background fabric and what fun the zig zags are! Cute butterfly and fits the front door nicely. Can't wait to see the little changes you have planned for Squash House. 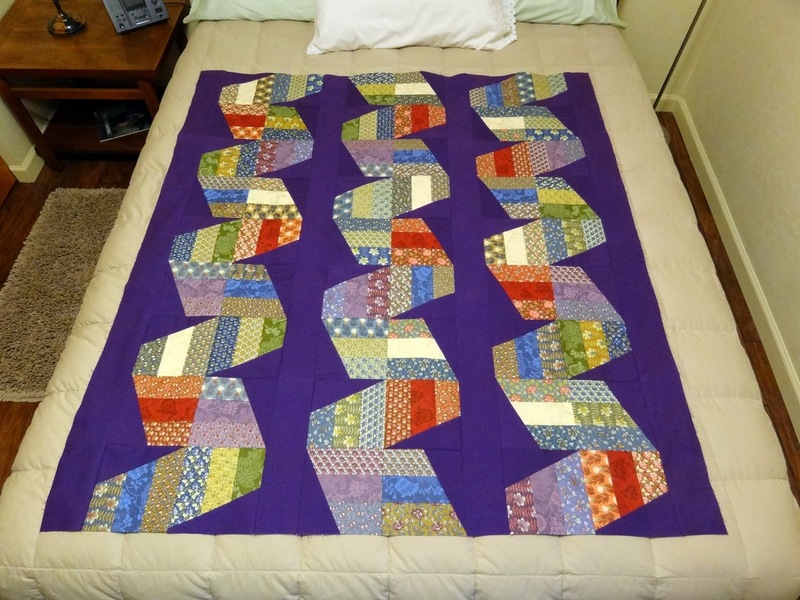 I like the purple and the orange together-the orange adds a neat zing to the quilt! Nice butterfly door knocker, it looks quite classy on your door. Quilt is gorgeous with the purple Candace!! Showcases the chintz perfectly!! The Boo flag is darling!!! I love fall/halloween themed anything. The butterfly is perfect!! Way better than an annoying door bell! that purple is perfect to show off those great fabrics. what a neat design. oh, such a pretty door knocker too. we are still doing updates at our house too. Hubby just got done hanging valances and vertical blinds now that I have finished painting. Wonderful fabrics. I bought a lot with Simone in Amsterdam and made Amsterdam Leaves with them. After you enthused about a wool batting, that is what it got. I had never seen the 3 designs printed on the roll either. Great idea!